Peter Taylor watercolour, Mt Sonder NT (36x54cm, Watercoloru Paper) c Peter Taylor courtesy Ngurratjuta, Alice Springs. Watercolourist Peter Taylor has died in a car accident. Peter Taylor was born into a large family at Oodnadatta in South Australia. His father worked as a station hand in the Central Desert region, and as a small boy Peter accompanied his father as he worked stations from Horse Shoe Bend through to Hermannsburg, 120km west of Alice Springs. These early years in Hermannsburg shaped Peter’s lifelong interest in painting. The picturesque location of Hermannsburg (set amongst the West MacDonnell Ranges) captured his imagination. 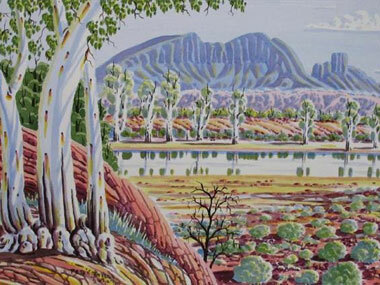 We can also see the inspiration of Albert Namatjira and his contemporaries in his works. After completing schooling in Adelaide, Peter returned to live in Alice Springs where he spent many hours alongside Clem Abbott and Keith Namatjira honing his skills. He went on to become a committed artist at the Ngurratjuta Iltja/Ntjarra Many Hands Art Centre in Alice Springs. His works are now exhibited in private collections and in galleries around the world. Peter was also a valuable teacher to a younger generations of artists; in the Big hART’s Namatjira project, he was a workshop leader at Ntaria School, committed to teaching students to paint, and to passing on the stories of country. He also led workshops with Ngurratjuta Many Hands at Alice Springs Desert Park, and at Yirara College, and performed and delivered masterclasses as part of in Big hART’s Namatjira theatre show and tour. His leadership is also evident in his appointment to the board of Desart, and his selection to travel to Shanghai in 2013 as part of a Desart artists exchange program. He is survived by his five sons, Ricky, Bob, James, Doug and Gary.